We’ve already tried twice to implement time tracking and we failed miserably. It was frustrating. For the entire team. 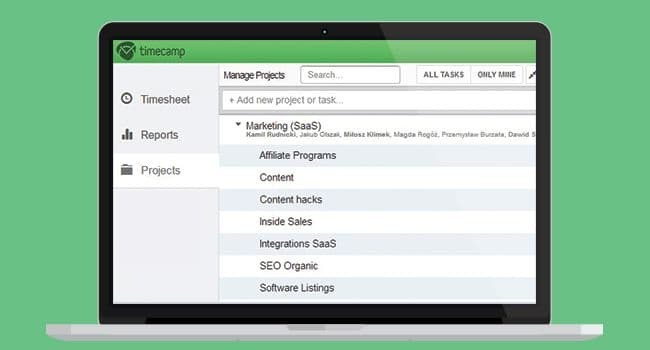 Today we want to share our tips on how to make a perfect kick-off meeting to start track time with TimeCamp. Hopefully, this will let you avoid lots of problems and frustration. Below are the five key elements that you should communicate to your team during the successful kick-off meeting. We recommend you to meet your team and discuss how they will benefit from time tracking. It is also your chance to set goals, share your plan and motivate your team to take the action. It shouldn’t be too extended. Three points you consider as the most significant are enough. Don’t forget that the kick-off meeting should be held by the person who is in charge of the whole implementation. In our company this is our CEO – Kamil. He precisely explained why we need time tracking in our company showing us that this will help us to plan our work better and check if we spend time on our priorities. We kept separated reasons for marketing and development departments. The development team needs it for empathy, to better understand our clients expectations and planning. In marketing team it helps us to analyze the structure of our work and check if we are spending time on the most important projects. We believe that time is precious especially in a startup, we can’t afford to spend it on non-important projects. Presenting the projects and tasks structure is another important point of the kick-off agenda. Keep it simple. Don’t go into details. 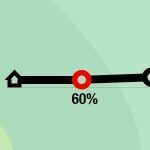 We’ve seen too many times that the very complex structure is a major cause of time tracking failure. Besides projects there shouldn’t be more than five items that are not strictly linked with the main tasks. To make the whole project a real success in the long term you should appoint just one person responsible for it. 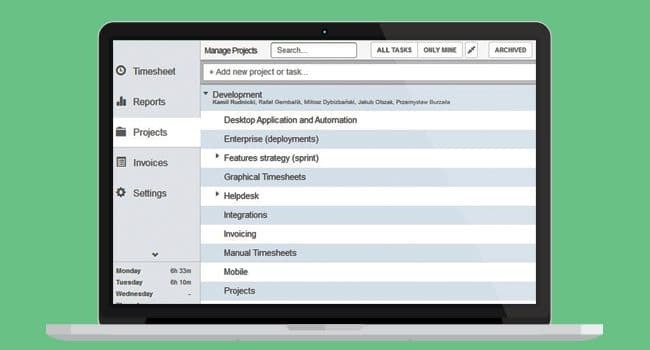 In our company, besides that everybody should see why timesheets are good for the success of the entire company, our CEO will be a project manager. He’s going to take charge of implementing and accounting all employees for filling their timesheets. He asked everyone to help him lead it to the end. This will make us more engaged. It’s also a big mistake to let everyone manage the projects. When everybody is allowed to make changes it creates the disorder and makes people confused. We believe that in the very beginning, person in charge of the implementation should be the only one who will manage the structure of projects and tasks in the organization. Explain that without this leadership there will be a mess in projects and tasks. There’s no better option to teach a person something than showing a real example. For many people filling timesheets is a real nightmare. 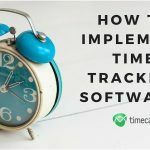 We wanted it to be clear for everyone so our managers showed us their own timesheets and shared their tricks and lessons learned from time tracking. This made the whole process more transparent to everyone. Our members were told that the perfect timesheet should be filled with a great care. We announced that they don’t need to be precise to every single minute of their work. This made them feel more comfortable. But we also asked them to not leave more than 15 minutes as it is the most reliable way to track time accurately. Your employees need some motivation to make it the habit. You can announce that timesheets will be checked regularly, it will help them to remember to do it on a daily basis. It is important to point that it’s not a form of control, but the way to give them some kind of assistance in the process, making sure they’re following the change, getting their feedback. Our CEO is going to check our timesheets every single day for the first two weeks. Then he’s going to do this every week. David – our COO will check marketing team, and report it to Kamil. We also found out that by publicly analyzing our timesheets, it made everyone in the team more serious about implementing time tracking. Hopefully, this post will bring you some hints how to manage your own meeting. Do not hesitate to share your experience, good practices or results in comments below. Good Luck! 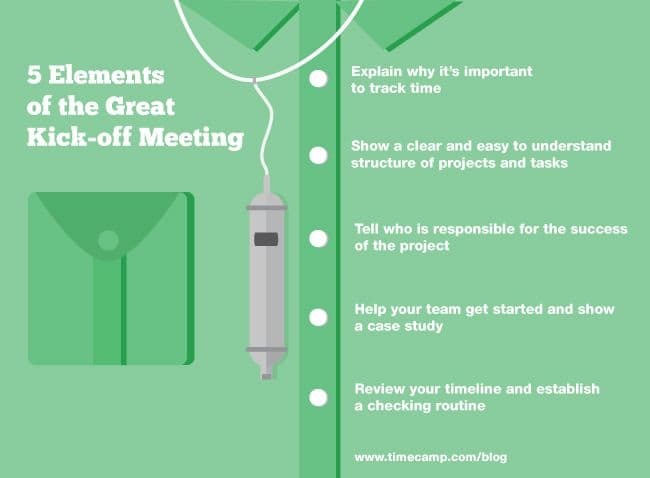 Another great post and recipe for success where the slides are to the point and could be used as a template to hold our own successful Time Tracking Kick-off Meeting. Thanks for continuing to develop TimeCamp which is just an awesome app and for writing such informative post to help us get the most out of the app as well. Thanks John, we really appreciate your words. We’re glad to read the content is useful.